No matter how well-maintained your equipment is, breakdowns can and will happen. When they do, it’s important to have a service provider who will go the extra mile to get you back up and running quickly. If your fleet includes Cat® construction equipment, you likely already rely on Gregory Poole for support at one of our five conveniently located repair centers. However, you also know that machines often fail where they work, not in the shop. To better serve our clients, we’ve invested heavily in mobile repair capabilities that can come to you when you need them. When unexpected downtime is affecting your ability to get the job done, every day you have to wait for service is one that costs you money. 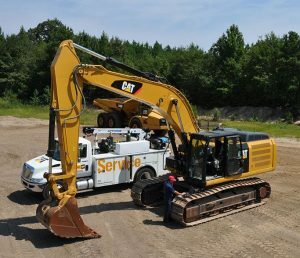 Gregory Poole dispatches service technicians to job sites all over eastern North Carolina with an average response time of 24 hours. We offer on-call service for emergencies at all hours as well as scheduled visits to your job site for regular maintenance. Our service technicians have an average of 10 years experience and are among the most highly skilled in the industry. Each technician carries a laptop computer equipped with the latest diagnostic software capable of tracking the history of every piece in your fleet. We’ve outfitted our mobile fleet to offer exceptional repair capabilities in the field. If it’s not possible to correct the problem at your job site, we can often perform temporary repairs that get you working again until you can schedule service. Since 1951, we have been committed to helping our clients succeed, no matter what a job throws at them. Whatever the issue, one call to Gregory Poole is all it takes to get a technician to your job site. Contact our service department for immediate assistance today.